“Tu fais des crêpes aujourd’hui ?” (Are you making crêpes?) my mum asked when she called to ask how we were handling the snow? The snow storm we’ve had on the east coast had made the news on the other side of the Atlantic, she added. “Pourquoi ?” (Why?) I said. I had completely forgotten. The 2nd of February. Of course. How could I have forgotten? As a kid, I would never miss the day of La chandeleur. There goes the French with their love for crêpes. My brother and I absolutely loved crêpes. And frankly, we never waited for D Day to enjoy them. He and I were masters in the art of having my mother cook stacks of them for us. I feel that Lulu will be the same. Thankfully. When I brought a plate of crêpes on the table, Lulu a.k.a my sweet stomach monster reached for one. “Mam, mam,” she exclaimed with her mouth full. Then she had another one. And another one. She liked to spread hers flat in front of her on the table, then grab it by one end before biting in the middle. It looked very organized. I preferred to spread passion fruit syrup on mine and roll them. In a large bowl, combine the flours, cornstarch, salt and sugar. Break the eggs in the middle and slowly whisk while pouring the milk. Continue to whisk until the batter is homogeneous. Cover with a plate and place in the fridge to rest for an hour. When ready to use, stir again. In a crêpe pan or frying pan, melt a little butter. Swirl to coat. Add about 1/4 cup crêpe batter, and move to coat the bottom. Cook for 1 to 2 minutes on medium to high heat. Once it starts bubbling and the batter looks cooked through, flip the crêpe and cook for one extra minute on the other side. Repeat until you run out of batter, adding a little butter between each crêpe. Keep the crêpes warm on a plate as you work, covering them with a towel. Serve with sprinkled sugar and freshly squeezed lemon juice, or passion fruit syrup, like I did. Dans une jatte, mélangez les farines, la maïzena, le sel et le sucre. Faites un puits au milieu et cassez-y les oeufs. Ajoutez le lait en filet en mélangeant avec un fouet. Mélangez jusqu’à ce que la pâte soit lisse. Ajoutez le beurre et la vanille. Couvrez avec une assiette et mettez à reposer au frigidaire pendant une heure, minimum. Une fois que vous êtes prêt à cuire vos crêpes, mélangez la pâte à nouveau. Faites fondre un peu de beurre dans une poêle à crêpe. Ajoutez une petite louche de pâte et faites un mouvement circulaire avec la main pour que la pâte couvre tout le fond en fine couche. Faites cuire 2 minutes, ou juste assez pour que des bulles se forment à la surface. Retournez la crêpe et cuisez encore une minute. Recommencez jusqu’à épuisement de la pâte. Ajoutez un petit morceau de beurre entre chaque crêpe. Gardez les crêpes au chaud sur une assiette (couvertes avec un torchon). Servez les crêpes avec du sucre et du jus de citron, ou un sirop aux fruits de la passion, comme ici. Oh là là these looks better than we get here in Paris! Wish my local crêpe stand man whipped THOSE up every day! 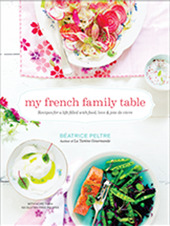 And look at those adorable petits mains rolling the dough – trop mignon ! So happy to learn there’s a day dedicated to crepes! Yours look delicious! and perfect for a snowy morning. Millet and chesnut flour?! How exotic. I love to make crepes, too, but I’ve never made any that poured from such romantic ingredients. I am so tickled to read your recipe and to go find these flours and try them. I’m inspired even though I’ll miss la Chandeleur! I love those beautiful photos of snow! Wow,I actually have millet flour in my kitchen! I ‘ve been reading Kim Boyce’s cookbook, Good to the Grain, and bought a few flours that I’ve never baked with before, millet being one of them. I’ll make your crêpes this weekend. I can’t wait to try them, especially since they have the Lulu seal of approval. P.S. 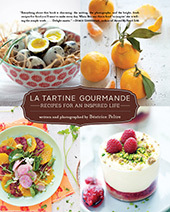 Looking forward to your cookbook! Oh, crepes! I like mine with bananas, Nutella and powered sugar. Mmmm. Les photos sont magnifiques, comme toujours! Et Lulu doit être tellement mignonne en mangeant ses crêpes!! Such a pleasure to visit La Tartine again and see the food art in its best, as always. Happy travels! Oooh never thought of using the chestnut flour. What a good idea. Beautiful pictures, as usual. J’adore les crêpes et j’adore votre blog! Vos photos sont vraiment superbes, quelle maîtrise! I have been having a crepe day every single night for the past seven years. My older son has to have them for supper–with nutella, and there is no excuse. I tried to make them with whole wheat flour, but I have never thought about chestnut flour.Thanks for an innovative suggestion.They look great! I came across your blog recently and I just adore it. Thank you for sharing all of your beautiful pictures and recipes! I’ll be back! Is it possible to use all Millet flour? Your photos are absolutely superb. Are you a professional by any chance? I live in Turkey and have never heard of chestnut flour! What is it? Never heard about chestnut flour before! This look divine. I love crepes! I’m known for grapping them right out of the pan – that’s when they are at their very best. Hummmm.. les crêpes.. Ma Lulu à moi les a réclamées comme goûter d’anniversaire il y a une dizaine de jours… Remplir les estomacs de 12 petits monstres affamés… il en a fallu des crêpes !!!!!! Lot’s of snow more time to cook! Thanks for inviting us to share this lovely day – beautiful snow pictures and crepes. My sister and I were the same with pancakes on Shrove Tuesday – ‘another one?’ my Mother would ask again and again until the whole jug of batter was gone. Why is February 2nd crepes day in France? L’ambiance après tempête est magique et tes photos restituent merveilleusement cette atmosphère 🙂 Et tes clichés de crêpes sont gourmands à souhait ! So beautiful. I have millet flour, but must find me some chestnut flour. I also wonder if the milk could be replaced with nut milk (for my vegan friend) ? The pictures are perfect. I love crêpes… Usually we prepare a big batch, enough for a couple of mornings… my favourite breakfast with a cup of black coffee.. I am making crepes with Nutella and banana this weekend! I only had a large pan for the crepes, so they are quite monstrous… but delicious! Thank you everyone. Sounds delicious that you’re going to make some. And yes, millet flour alone would work too. In this case, perhaps add 1 tablespoon cornstarch more and 1 or 2 less millet. Look at the consistency of the batter. Not too thick, and not too runny either. great crepes, pictures are beautiful. I just realized that here in Italy we don’t have a proper food for Le chandeleur (we call it La candelora). It seems appropriate to make crêpes from now on! I used to love crepes as a child, but it has been ages since my last time with crêpes. Time to make them again! Thank you for being always a great inspiration! My husband and I spent 10 glorious days in Paris in late October. We had crepes for lunch almost every day because they were always so delicious and the convenience of not spending too much time in the restaurants. My all time favorite was plain – with only butter and sugar. Your article brought back a fond culinary memory! There is no such miracle as a child. Passing your mother’s teachings and traditions to your child offers a piece of your mother through her to continue down through generations. That is what I love about family and food. Lulu will be stacking the crepes and soon making them herself. Nope. You can never forget February 2nd. Oui, je suis un peu en retard avec mes traductions en français. J’essaie d’y remédier très vite. Merci! Valerie, oh yes, I cannot wait to see my Lulu stack them up! She completely knows what they are already, which makes me very happy! Hum.., elles ont l’air bien bonne ces crêpes sans gluten! Ho, que de belle chose sur ce blog… Je découvre petit à petit comment virvre sans gluten et ton blog est une magnifique source d’idée ! Les crêpes me manquent… et ta recette est (à l’air) succulante ! If I needed to use a nut-free substitute for chestnut flour, would you recommend anything in particular? La Chandeleur (Maria Lichtmis) is crepe day over here (Belgium) as well!! 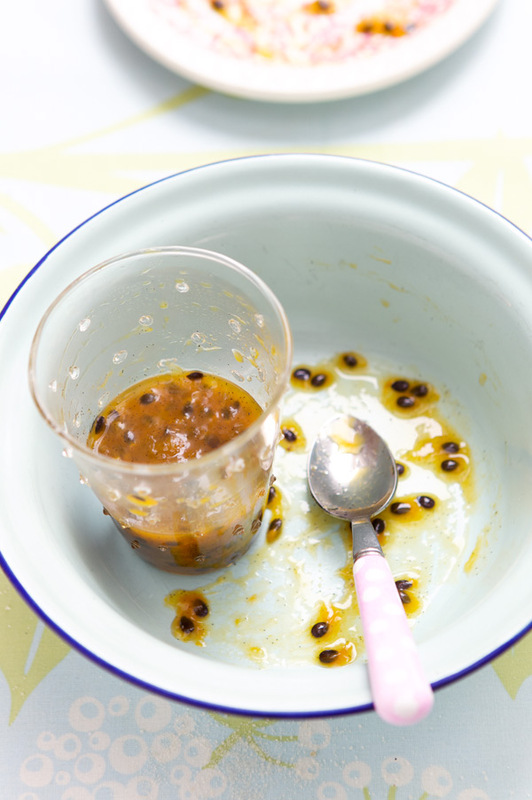 Do you have a recipe for the passion fruit syrup – looks delicious!! I just should not look at your blog when i am hungry! We will now have to make crepe or pfannekuchen (german for fryingpan cake) tomorrow. In the uk they also have a pancake day, symbolising the beginning of lent, one last treat! But not for us I think 🙂 thanks for your blog. Wow this sounds quite exotic! I make crepes almost every week in some form or fashion but I have never tried millet and chestnut flour. I was wondering what I was going to do with the passion fruit growing in my back yard. You have just given me the answer. Thank you! Yum yum yum! Always loved crepes, probably always will! Love the photographs too, the snowy shots look really good. Wishing I could have one of those crepes right about now, sigh. Thanks! ooo! gorgeous, and gluten free as well! I will try these soon. I love mine spread with homemade apricot jam and sprinkled with slivers of almonds. I`m sure that tastes delicious! I do love the usual crepes… but this batter, with millet and chestnut, sounds so amazing I’m not even sure it can be put in the same category! But chestnut flour… is that something you can buy? I haven;t seen it… Or do you just grind up roasted chestnuts yourself? What?! Lulu in white??!! Haha. Je viens de decouvrir ton blog…et je veux preparer tous ces plats! I think my bookmarked recipes just got multiplied by two! De magnifiques crêpes!! C’est un incontournable et surtout pour les enfants. Et quelle neige! Le paysage est splendide. Incroyable! J’ai complètement oublié la chandeleur cette année! It’s too bad, as it was also one of my favorite holidays as a child, and I love *love* crêpes–my favorites are with Nutella. Thank you for this! The photos are all so magnificent! They are so beautiful. Thumbs up for it! For some reason we don’t make crepes much – it’s not part of my repertoire and not part of the south-of-france cuisine. but they are so fun and yummy I think I will do it to cheer us all up on the next dreary day that comes along. Your daughter is a lucky little girl because her Mom can make the most delicious food : ) Yum! Hi! I’ve recently discovered your beautiful and colorful blog and … here is the recipe I was looking for this afternoon snack! My french cousins always cook them for me but it’s time to have a go and i’ll let you know about the outcome! This is my first visit to your blog and I am blown away by how superbly you tell your story, illustrate your points with photos, etc. It is personal, real and informative all at once. This blog jumps off the screen with personality! The crepe story brought back memories of a particular French foreign exchange student who lived with us for a summer and his impeccable crepe making skills. The history and the culinary beauty of crepes will stay with my family forever. Thanks for the reminder and this lovely blog. miam j’en mangerais bien de tes crêpes …. et avec du sirop de fruits de la passion, ça doit être top ! J’ai trouvé ton blog par hasard, mais je ne le regrette pas! Ta fille a de la chance parcque tu fait la cuisine pour elle. Cette recette à l’air divine. I’m mad about chestnut flour, love your recipe! Thank you everyone. I know what we are having for breakfast tomorrow again! Thanks Georgette. Canon 1D Mark 4. Wow, so simple and so delicious. I just bought a proper crepe pan, now I must get to work! I managed to cook them yesterday evening… delicous! Filling included…strawberry jam, agave syrup and … nutella! I would love to know where (especially if it is in the US) that you found the passionfruit syrup!! I am obsessed with Passionfruit (I found some in the grocery store yesterday and paid extortion to bring them home with me; I also have a stock pile of passionfruit pulp tins in my pantry from my travels to Australia that I am rationing). I would LOVE to find the syrup here in the US to mix with my yogurt and also for the crepes! I made my own. Not easy to find indeed. Afin de faire une version sans produits laitiers, j’ai remplacé le lait entier par de la boisson aux amandes et le beurre par du beurre végétal Earth balance. De plus, j’ai fait cuire les crêpes avec du beurre de coco. Et le résultat est superbe! J’aime beaucoup l’idée d’utiliser des farines de noisettes et de millet car il arrive souvent que dans les recettes sans gluten, il y a des trop de fécules et de farines non-entières. 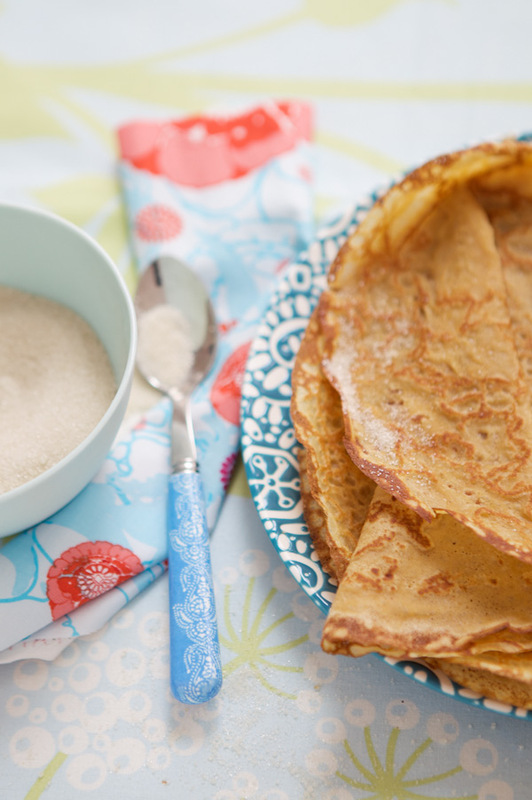 millet and chestnut flour crepes…hmm…something new to try! j’aimerai bien essayer ta recette à cre^pes pour un après-midi entre amis. Est-ce que je pourrais remplacer la farine de millet par de la farine de riz très subtile e la farine de chataigne par de la farine d’amande, selon toi?